The arctic: a land of subzero temperatures, beautiful icy vistas, and home to a myriad of creatures – great and small. These days? It's a war-zone. In Penguinz, an arena style shooter by developer LongAnimals, you take on the role of an extremely disgruntled penguin with an unquenchable thirst for violence. The play-mechanics and structure of the game should be very familiar to those who’ve played other arena shooters. 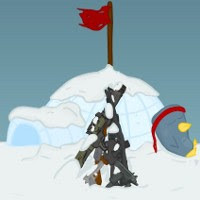 You’ll basically need to use your available weapons cache to gun down increasingly numerous waves of enemies, ranging from other penguins, to gun-toting polar bears, to Eskimos – and more. Downed foes will often drop power-ups (money, ammo, health) which should be collected so that you can stay alive and expand your arsenal. Every few rounds, you’ll also have to face-off against a “boss.” These battles can be a bit more challenging, and though they’re not very intricate, they’re typically pretty funny. Between levels, you can use the cash you’ve collected to purchase more powerful weapons, ammo, and health. The progression is well managed, and you’ll often find yourself just a round or two away from a better weapon. This style of shooter is hardly new to the Flash gaming space; however, Penguinz delivers an overall package of smooth controls, over-the-top violence, and charming characters that makes for a fun and action-packed experience.